Commonly called Dolphin Fish or Dorado, these beautifully marked pelagic and migratory fish inhabit all of the worlds tropical seas. 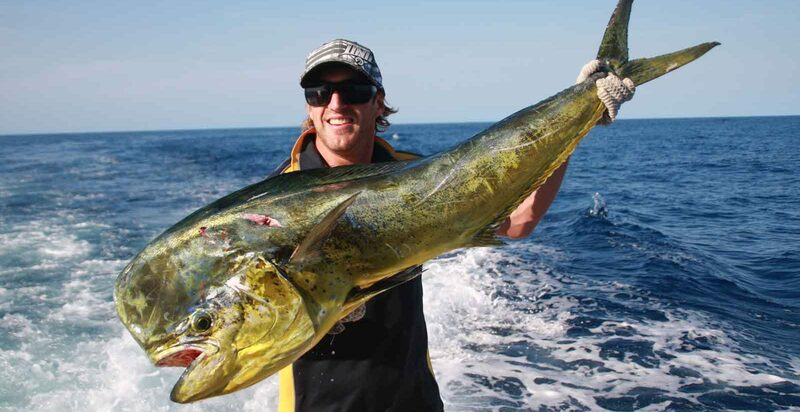 It is a prized light tackle sport fishing target and well respected for its acrobatic and aerial display. Vivid gold and blue when lit up during the fight it will readily take lures and flies cast around floating structure as well as baits cast in their vicinity when feeding. Good quality tackle, a spinning outfit loaded with six kilo line is ideal with fish to over 1.5 metres in length and up to 25 kg available during the warmer months in our reef waters. Excellent eating qualities, but must be bled immediately and chilled to preserve their delicately flavored short-grained flesh.